Quote Reply Topic: What was your motivation? I'm curious, what got other people into Jeeps? Or when did the bug bite? I "got it" when I started volunteering at a local museum that has a '42 MB that saw service in Italy and Northwest Europe. I'm sometimes assigned to drive it in "Tank Day" shows. When I was maybe 9, my dad woke me up one saturday morning and asked if I wanted to go to the Jeep races...I was hooked after that. A jeep was the first thing I was allowed to drive by myself, mostly on the farm. Took it hunting and fishing with a few trips over to the neighbors. I would guess I was 10 or 11 then. I think I was in my 40’s when I thought I needed another one. One of the best things I’ve done. Handy as a pocket on a shirt around the farm. Unless it’s raining I use one daily for the choirs. Cold weather is fine, I have to be out in it anyway, cold and wet is not so good. Dad had a junker 49 3A when I was born. I have only one memory of it. That of it sitting next to CHUG A LUG at some time prior to Oct 12 1962 (Columbus Day Storm) At the time I was 5 years old I remember a little bit about Dad dragging CHUG home from a farm in Scotts Mills about 10-12 miles away. And then the first big memory of CHUG is sitting in it (before dad got it on the road) trying to shift the gears and Dad telling me I would wear out the transmission. I was still age 5 at the time. Dad got Chug Running and started driving it to work sometime in early 1963. I remember both times he painted it in the driveway. 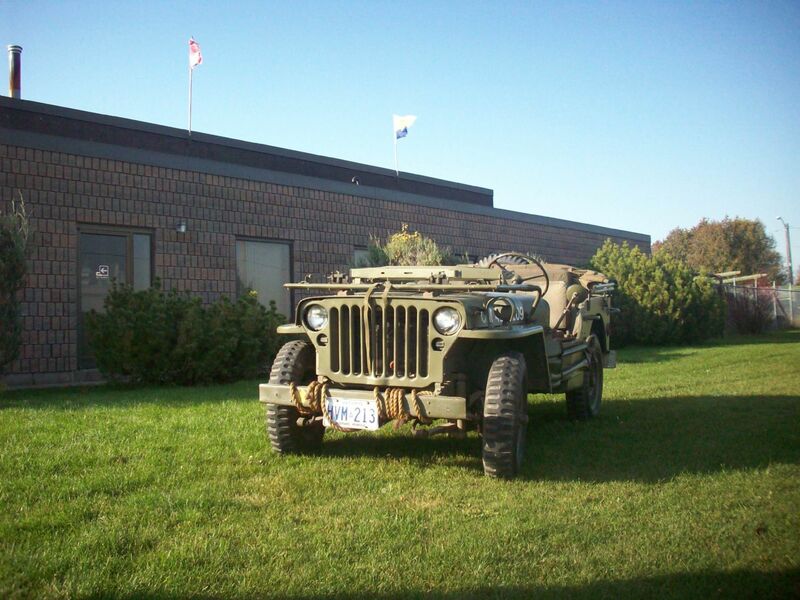 And then I remember going to the very first meetings of the Salem Jeep Club in 1964-65 (club history has them forming the club in 65 but it seams to me like their were meetings at the local Jeep Dealer either very early in the year or late 64. Form the forming of the club until maybe as late as 1970 we did all sorts of adventures with the Club from visiting the Oregon Dunes in Central Oregon to trips to Sand Lake at the beach. Dad also joined the Marion County Search and Rescue (part of the Sheriffs Dept.) we did stuff all the time with CHUG Parades and Hunting and Fishing etc. Dad continued to drive CHUG to work through the 60's then in 1970 he bought a Green J3000 Gladiator Pickup. And Chug kind of went to pasture. Then in the summer of 1974 I got a job (at 15) working as a framing carpenter with my uncle and I drove CHUG to meet him about 3 miles from the house I parked CHUG in the ditch for the day after ridding into Salem to the Jobs in Uncle Arnolds falcon station wagon. Which must have had 13" Disc brakes on it cause he drove it at full speed up to every stop only applying the brakes a few feet from the stop sign or traffic light. Scared the hell out of me every morning. After that summer I started driving CHUG on dates and going to Bicycle races etc. Through High school it was my car. But dad would not let me actually drive it to school. He said he paid taxes for the bus we were going to ride in. Last time CHUG was driven on the road was Sept 19th 1976 3 days before I left for college and at the end of about a 1000 mile 3 day weekend were a buddy of mine and I took CHUG all the way to the Alvord Desert in Easter Oregon on the back side of the Steens Mountain. EDIT: And my first vehicle I ever bought was a 57 Willys Wagon stock drive train some idiot had done a SOA which led to the roll over that ended its useful life. So I don't think there ever was a time that Jeeps weren't part of my being. Hard to say. I've been a motorhead all my life. My grampa's fishing boat with a 5 horse Merc was the first vehicle I could drive. I think I was about 7 when I started taking it out by myself. I got my first go kart when I was about 10 and went through several over the next 8 years. Due to lack of pavement to drive legally on I started driving the karts off-road. They broke a lot so I switched to dirt bikes, but really was more of a 4 wheel guy. I was about 9 when I subscribed to my first 4 wheel drive magazine (PV4). I remember being interested in Jeeps before then, but there weren't any in my family. My dad bought a 1929 Model A Tudor sedan as a father-son project when I was 10. That got me hooked on old iron. We started that rebuild which I ended up finishing after college. I bought my first (and so far only) Jeep not long after college (before the Model A was done). It was a '75 CJ5. It was just a beater / driver until I finished the Model A, then I rebuilt it into a decent trail rider. 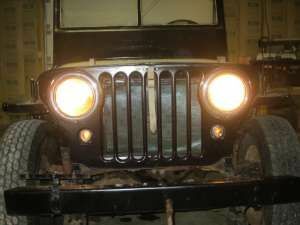 I had hoped to keep the Model A, but life said I couldn't keep both, so when the Jeep was "finished" I sold the A. My sons outgrew the back seat in the Jeep so I upsized to the '71 Bronco I still have. Again I had hoped to keep both but wasn't able to, so the Jeep went away. Now I'm a (new) empty-nester and I'm trying to figure out what life will look like. I'm hoping to keep doing automotive projects, and I'm looking for what the next one will be. I love the Bronco, but there was something a little more fun (if less practical) about the more open CJ5, so another Jeep has always been in the mix. 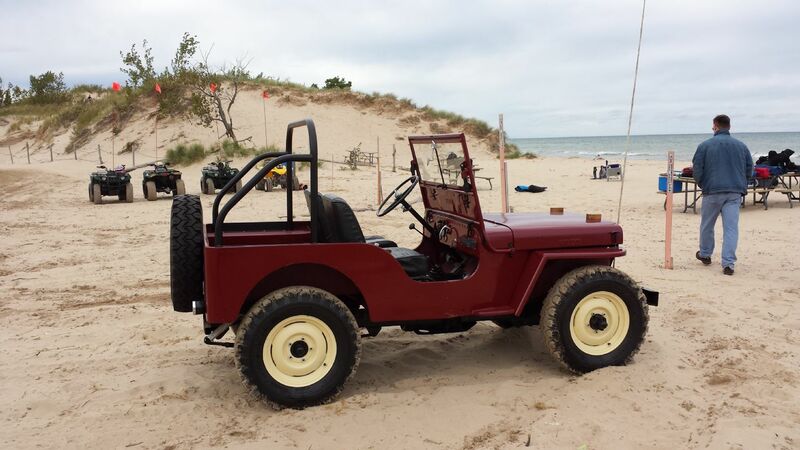 I've always like the looks of the early flat-fenders, and that, along with my Model A induced love of old iron makes a 2a attractive (the fact that it's less practical than a CJ5 is sort of irrelevant since I have the more practical Bronco). Then I started running into videos with some of the guys from this page so I dropped by. It seemed like a great group so here I am, Jeepless (for now at least), but still hoping! 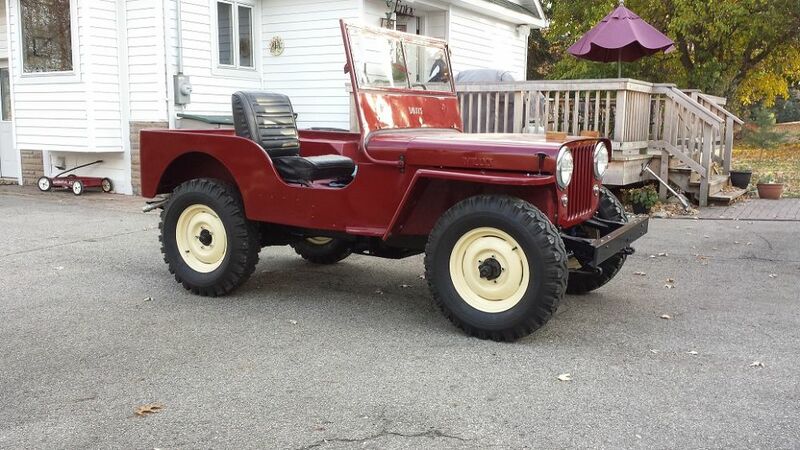 My father-in-law offered me his old '47 CJ2A. My son was 8 at the time and I thought it would be a cool father and son project. My son's 15 now and we still tool around in the summer. I've been told my Grandfather plowed in a Scout that had no brakes. I would ride with him from time to time. This was before I was 4. I have no memory of it at all but it put a lasting impression on a young me. Not much later My mom took us kids ( my sister and brother) to visit a high school friend. Her friends husband had a multi colored CJ7 and he took us kids down a bunch of trails in South Eastern Ohio. I guess i was around 11 or 12. My older brother and I were out "four wheeling" in a 1966 Rambler. We got that poor thing quite stuck. We hiked out to a pay phone (remember those?) and he called a friend. Said friend showed up around an hour later in this amazing vehicle. It had some sort of device on front with a rope and hooks. Being the smallest - it was my job to crawl under the Rambler and find something solid to hook to. He pulled us out with very little effort. Turns out that vehicle was actually a Toyota Land Cruiser with an 8274 on the front. I didn't know at the time what the heck it was. But it was cool. I became obsessed with anything 4WD since that day. I read every magazine I could. I'd ask any person willing to answer questions about their 4x4's. The summer I was 13, I worked on a farm picking corn. The old man has an old CJ5 with a plow that i was obsessed with. HE never let me drive it. 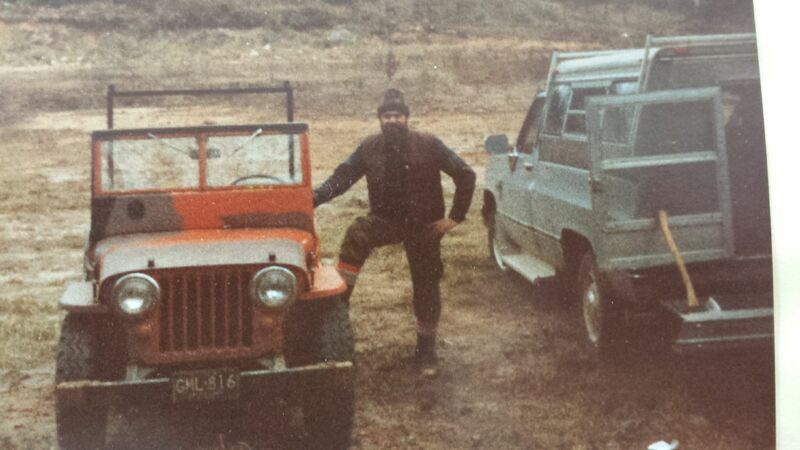 But he taught me all the features and was quite proud of that Jeep. 25 years later I ended up owning that Jeep. but it was just too far gone to salvage much at that point. Still breaks the heart. My first 4x4 was a 74 Cherokee Chief. I was 14. Still wish I had that one. Anyway, I've had all sorts of 4x4's. But I always gravitated to the Jeeps. 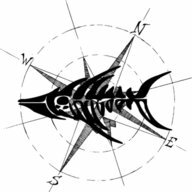 Eventually all other brands and projects we abandoned. Soon after that all Jeep models other than flat fenders were abandoned. So it was a Land Cruiser that got me into Jeeps.....in a round about way. Never found that 2a, but hauled that buick all over for 35 years...and life slowed just a touch. Started searching out a 2a for the buick, and found one but in my advanced age I fell for the L-head, hard... the last several years have been a blast. When I was 7 or 8 (mid 1960s) we'd visit my uncle and aunt who lived in the country in central Kentucky. My uncle had a good-size wood mill on his property along with an old Jeep. I'm guessing it was a surplus MB but it was so long ago I don't remember any of its details. My dad, a World War II vet who had a lot of experience driving Jeeps in Germany post-war, would take us for rides around the farm and would never miss an opportunity to climb it up the side of a large scrap pile. I thought that was the coolest thing ever. 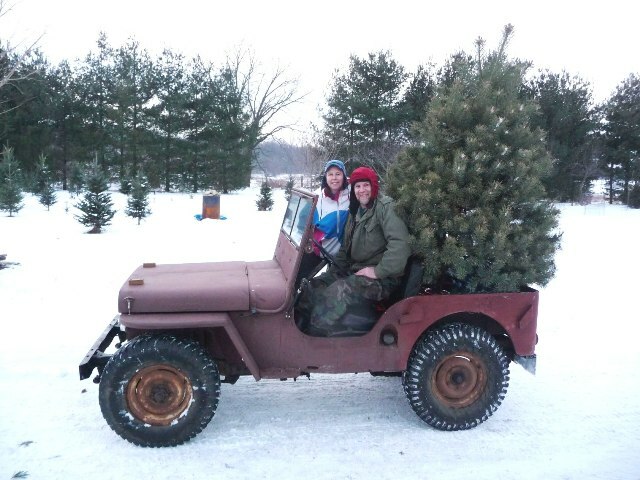 I never knew what happened to that old Jeep but fast forward 40 years when life settled down, I was able to buy my own. I was about 10 years old when my dad bought a 1983 CJ7. I loved riding around in that thing. He sold it after a few years and bought a 1948 2A. I drove that thing around all through high school. It was then that I was hooked and knew I had to own my own some day. I was about 20 when I bought my first Jeep. If you can call it that. It was a 1992 YJ. I did some modifications to it over a few years and put a ton of trail miles on that thing. I always knew that I really wanted a flatty. I just had to wait for the right time and the right vehicle to come around. I was about 24 years old when it happened. I found "Thumper" my 1950 3A on Ebay. I got to looking at the listing and found that it was located only about 25 miles up the road from me. I contacted the seller and asked if I could come look at it and he said I could. That evening I went and looked at it and knew I had to buy it. I asked if there was anyway he would sell it to me off Ebay. He thought about it for a few minutes and agreed to do it. I went back and picked it up the next night. I grew up in ours. I was never a Jeep Fanatic, always just loved ours. Dad got it when I was 3 or 4. He drove it to construction sights for years and every so often hunting. In time, it became my first car. I tried to climb anything that looked challenging. Soon I got the thrill of learning how to fix what I broke. Fast forward a half century and Dad is gone, but the same Jeep remains. To Joe DeYoung: My goodness, your shop is Willys Heaven! Racks of flatfenders! A tractor and even a Model T! Love the pics, thanks for sharing! While being a young boy in the '60's, playing "Army" was just something that was done...so my best friend and I had our "troops" the 2" green Army men that came in the set with a...JEEP! Then, there was the ads in the Popular Science that advertised the "Jeep in a crate" Boy did I want one of those! Then I spent time building models...when I was 15, I spotted a familiar grille in the weeds behind the local volunteer fire department. 1948 2A! After a call to the local firefighter who lived down the road, a price of $500 was set on. It took most of what I had saved from working the summer before, but it was mine! So with help from some friends and their Dads, i got it back home. It has the typical issues from sitting. Stuck motor, no battery, no brakes. That winter, I worked on it non-stop. When it had warmed up some, it was time to try and get it to start. The battery was recharged, but still a little weak to spin the motor fast enough to start. A buddy said he would pull me with his truck, and I could pop the clutch and start it up. Great! So off we go..up and down the oil top roads...pull and pop...pull and pop..no go...we checked the wires, switches, plugs, wires..everything looked good..pull and pop...pull and pop....finally Jeff stops and walks back and starts talking...then he gets this look on his face. Then he starts laughing and hitting me in the arm! "You big dummy! You have to put the switch to "ON"!" After that, we pulled it about 10 ft. before it started. It was the best feeling ever finally driving that Jeep! Not much time, but skimmed thru the thread, looks like some great stories here! . . I need to come back later to read more carefully. After college, married with 2 sons, my uncle bought a '2A as a hunting vehicle. I loved that thing. He could not keep it running, got frustrated with it, and so I bought it from him for $300.